Like most people, we think that area rugs are a beautiful addition to any room. Rugs can also protect your hardwood, tile, and carpeted floors from everyday wear and tear. However, rugs tend to receive most of the foot traffic in a home and hold a lot of dirt and grime in their dense fibers. In other words, they get really dirty, really quickly, and a dirty rug doesn’t look nearly as good as a clean one. You don’t have to settle for living with dirty area rugs that ruin the beautiful image of your home! Let Southside Chem-Dry bring the patterns and colors of your area rugs back to their original beauty with our area rug cleaning service. Our rug cleaning experts are trained in treating many different kinds of rugs, including delicate oriental rugs, and can bring almost any rug back to life. Our rug cleaning professionals can have almost any rug in the Norfolk area looking virtually as good as new. Our green cleaning products are virtually residue free, which means your rugs will stay cleaner for a longer amount of time after the cleaning. Talk to your experienced technician about Southside Chem-Dry’s Protectant and how it can help your rugs last longer and better withstand daily foot traffic. Your oriental and area rugs are not just treasures; they are also very valuable investments. We know this, and you can always count on your Southside Chem-Dry technician to clean your area rug with meticulous care. Southside Chem-Dry uses special solutions that are designed especially for area rugs. These solutions take advantage of natural elements, like air, water, and natural carbonation. Our specialized drying technique will minimize wicking and preserve the dye within the fibers of your rug. This leaves the colors of your rug vibrant and fresh, just like the day you bought it, instead of muddying them like some other rug cleaners in the Norfolk area are known to do. 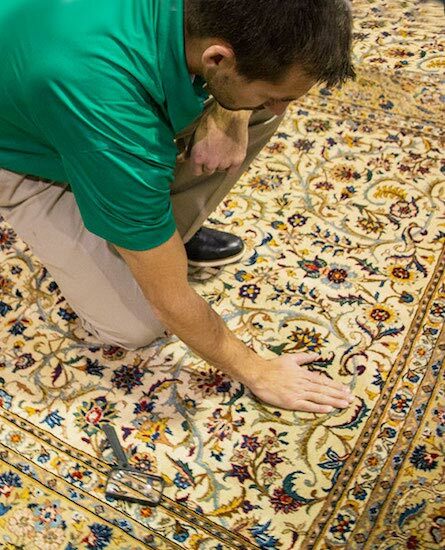 Our expert technicians will evaluate your rug and implement the most effective process for rug cleaning. Our process typically includes a pre-spray cleaner, a gentle submersion bath, and expert drying and fringe cleaning, but is tailored to meet the needs of your specific rug. We can clean all types of area rugs, including delicate fringe, antique rugs, and more. Southside Chem-Dry’s trained rug specialists are certified and equipped for any rug emergency in the VA Beach area. They are experts in area rug cleaning and perform a thorough evaluation to determine the safest, most effective method of cleaning your valuable rug, whether it needs to be cleaned in your home or at our facility to achieve optimum results. Due to a wide variety in construction materials and styles of area rugs, we will provide an analysis and prepare a free, no-obligation price quote before beginning any work.